I say “intended to” because the puzzle appears to not be possible to solve. Specifically, the 0110 piece is rather intransigent for the configuration on the left, and it doesn’t seem possible to fit two of them in without changing the piece set. Which is indeed what I did to put together the solution shown at top. For the configuration on the right, 0101 is the problem piece. In crossed stick puzzles, we like for solutions to be “assemblable,” meaning that there is no cycle of pieces where each has a downward facing slot connected to the next piece and an upward facing slot connected to the previous piece. (If there were, there would be no piece you could place last.) 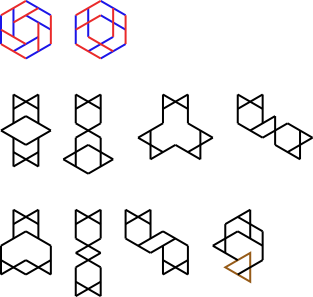 The assemblability condition implies the existence of a partial ordering among the pieces, where the pieces are ordered according to which ones are “on top” of other pieces. It follows that that there must be at least one piece with all slots pointing up and one piece with all slots pointing down. But what about the rest? Is there some way we can change our piece set to be able to make them? If we allow the middle slot to take all four possible combinations of up/down and deep/shallow, while the outer slots are deep/shallow and, as before, point the same direction, the resulting set should be more flexible in the configurations that can solve. (Conveniently, there are twelve such pieces.) 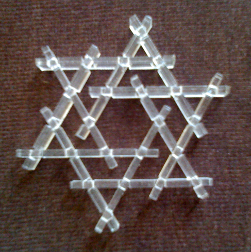 Any subconfiguration with a cycle formed by an odd number of pieces that is connected only by outer slots is still impossible to solve. Therefore the configuration with the triangle shown in brown is still impossible. But the others should still be solvable. and 2 of each of the other 4 possible pieces.